Sometimes an orange aisle runner is just what your event needs. The above fashion show contacted us to provide two aisle runners for an outdoor tent fashion show – in shades of orange. As you can see they made a clear runway, highlighted the models, and were very seasonal – Autumnal. 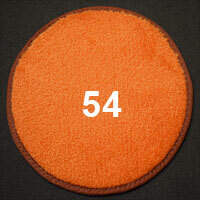 Shades of Orange – in a custom event rug you can select from over 20 shades of orange in our custom color charts.